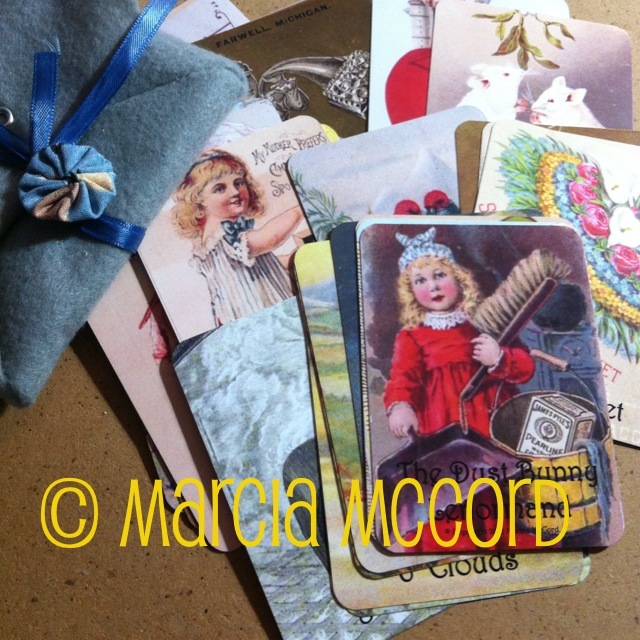 I’d like to begin 2013 with a gorgeous Lenormand Deck: the Dust Bunny Lenormand, a creation of Marcia McCord. This is a simple and yet powerful Lenormand. If you love Vintage as I do, this is a must-have in your collection. Its whimsical images and powerful attraction makes it a great tool for Lenormand readers. The paper quality of the deck is great, and it’s very easy to shuffle. Cards are thin but strong enough to be shuffled as many times as you want. Colors are just shinny and very appealing, while keeping the vintage atmosphere to the whole deck, making it totally consistent and delightful. Its Vintage composition is a delight for the eyes (I’d say that’s perfect). Some of the cards are very powerful, because of the images chosen. The Deck came with a wonderful handmade envelope made by its author. Not all envelopes were exactly the same (the 2nd edition). It seems that envelopes were different, or slightly different, from deck copy to deck copy, which made the deck you got unique! My envelope is grey and blue, and I can say it’s gorgeous! One of my favorite cards is the Rider, which brings news. There’s a giant Newspaper behind him (the Courier Journal), which makes it easier to be read (at least for me). I also love the card of the Key and the Star, which just pop out fiercely. All cards have images that show the central element of the card at first sight. Even though this is not a “traditional” Lenormand, you can use it without any problems. If you are a fan of intuition, it will help you as well. The result is staggering: this is a great deck for all publics, traditions, new age readers. The Deck brings you to other times, it makes you travel and discover new horizons. It’s dreaming, whimsical and astounding! The personality of Marcia can be found in each of the cards, even in the cover card that accompanies the deck! It’s just amazing how choosing vintage images can be so difficult, specially if you have to leave your personality in them. Marcia just did so in a natural way. Pepi: Why the Dust Bunny? Marcia: I get a lot of my inspiration from visual stimuli around me… and I’m a terrible housekeeper! My cat Tony had recently pulled a dust bunny from under a bookcase that was heroic in size. Since I talk to all my cats as if they were people—they are people, aren’t they? —I told Tony, “We could knit a whole new cat from that!” And suddenly the Dust Bunny Lenormand started to come to life. P: From where did you get the inspiration? M: I had leftover images from other efforts which triggered that Lenormand “spark” in my mind. Someone on Facebook had suggested that I do one when we were talking about my tarot decks and it seemed like the next natural thing to do. P: Which layouts do you think will fit best your deck? M: I feel I’m still learning the different layouts for Lenormand myself, so I’m thrilled when I see people doing readings with The Dust Bunny. I’m comfortable with pairs, a 5-card layout, a 3×3 and I’m getting deeper into a Grand Tableau with more advanced concepts like mirroring, knighting and houses. The Dust Bunny Lenormand is what I consider a “warm” deck that invites the reader to come closer and interact and perhaps share a story or a laugh. It’s intimate and therefore well-suited to the kind of readings Lenormand is known for. P: Which is the most gratifying thing/emotion you got from creating this wonderful deck? M: I love my own in-jokes with my decks and I’m always pleased (like a naughty child) when others get them too. The cover card has been noted to look a bit like me and for those who know me well, they know the role of cleaning girl is not my forte! I may have all the tools but like my little Dust Bunny girl, perhaps not all the skills, strength or attention span to catch every speckle of dust. The back of the cards in this deck shows the grown-up me, not given to the industry of cleaning up so vigorously but much more suited to leisure and perhaps a little disobedience! P: Any tips for the readers? M: I agree that the Lenormand should not be filled to the brim with additional symbolism designed to stimulate your deepest subconscious. But there’s intuition on the surface of things too and the Dust Bunny, while not being that typical Lenormand showing the image with a stark background, does focus your eye on the important topic of the card. The Child has a slate and is learning. The Dog’s mission is to be the loyal friend to man and protect those who, perhaps in a past stage of evolution, might have been prey. The Coffin is clearly The End. Let these images focus your eyes and mind on the meaning of the cards and let the keywords pop out naturally as you read. Best wishes!